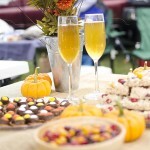 It’s a two-for-one post today, folks…two fun ideas you can try with just one box of Honey Maid Graham Crackers! 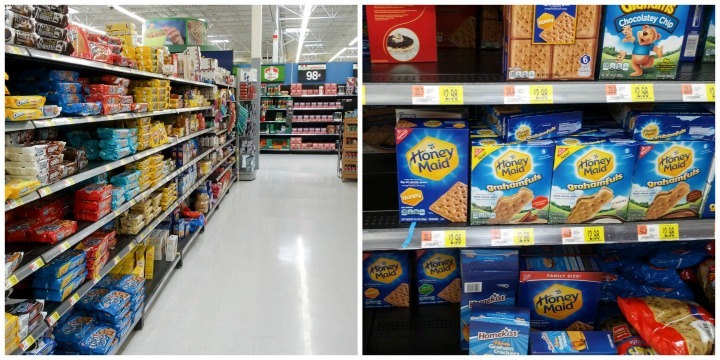 I picked up a box at Walmart the other day – you can find them in the cracker aisle, just look for the blue box. 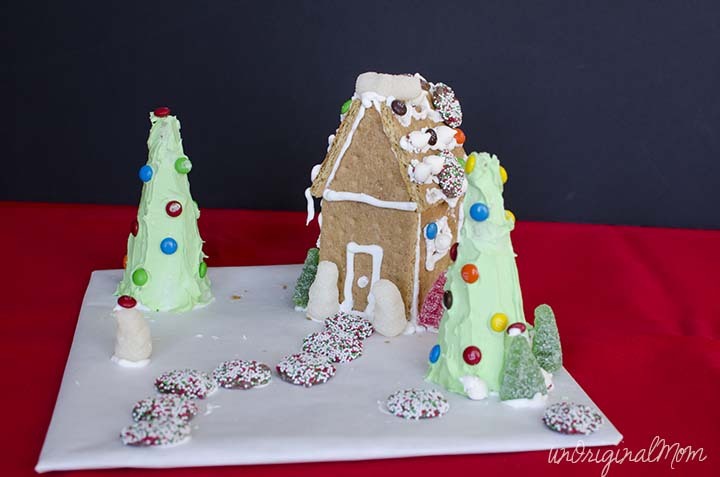 The first is not a new one to you, I’m sure, but worth a reminder in case you’ve forgotten about this fun project to do with your kids…use some Honey Maid Graham Crackers to make a simple “gingerbread” house! Make your house whatever shape you’d like! A serrated bread knife (using a saw motion with almost no pressure) works well to cut the graham crackers if you need to. A piece of cardboard (I used a box flap) covered with freezer paper makes a great base for your house, or even a little village! 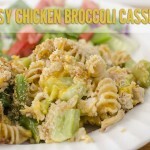 A styrofoam or paper plate would work, too. Royal icing is the ultimate frosting “glue” – it will hold together anything! I used meringue powder instead of egg whites so it was safe to eat. If you’re not ambitious enough to make a batch of icing, though, store bought icing will get the job done too. Use a muffin tin to contain all of your candy decorations – it keeps everything within reach, and it’s virtually impossible to knock over. 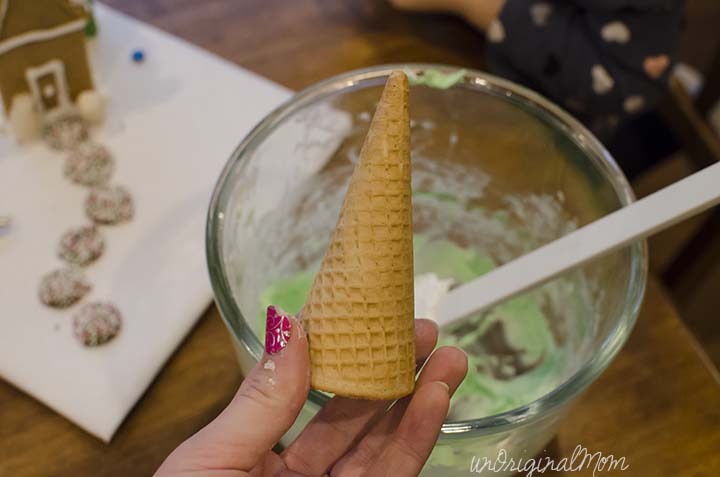 Cover an ice cream cone with green frosting to make a Christmas tree! 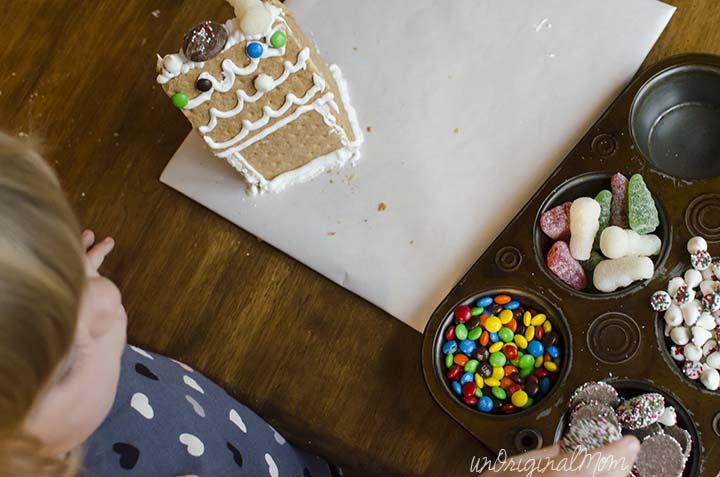 My two year old had a blast making her gingerbread house! 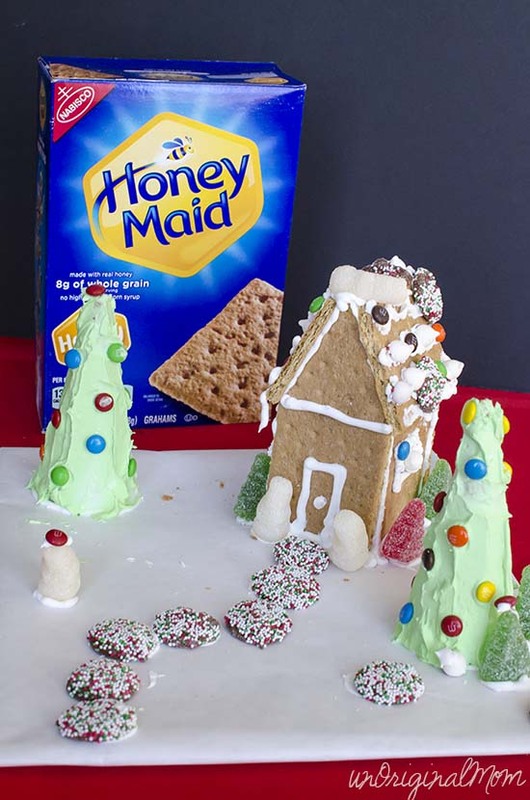 Honey Maid Graham Crackers should be a staple for your holiday baking recipes, too! I recently attempted some “Rudolph Peanut Butter Balls” with Honey Maid Graham Crackers as a special holiday sweet treat. They didn’t turn out exactly as I had envisioned…but still pretty cute, and absolutely delicious! 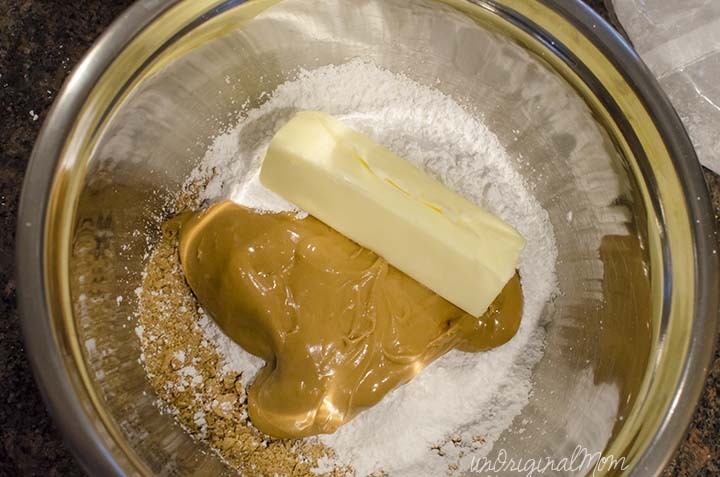 Make sure to mix well until the dough is uniform – it will be crumbly, but you don’t want any big chunks of butter. 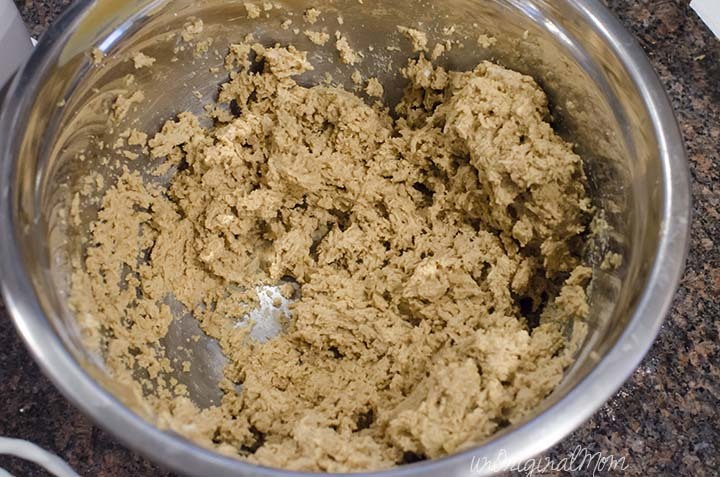 Then chill the dough for about 30 minutes until it’s easy to roll into small balls. Here’s where my vision failed me. 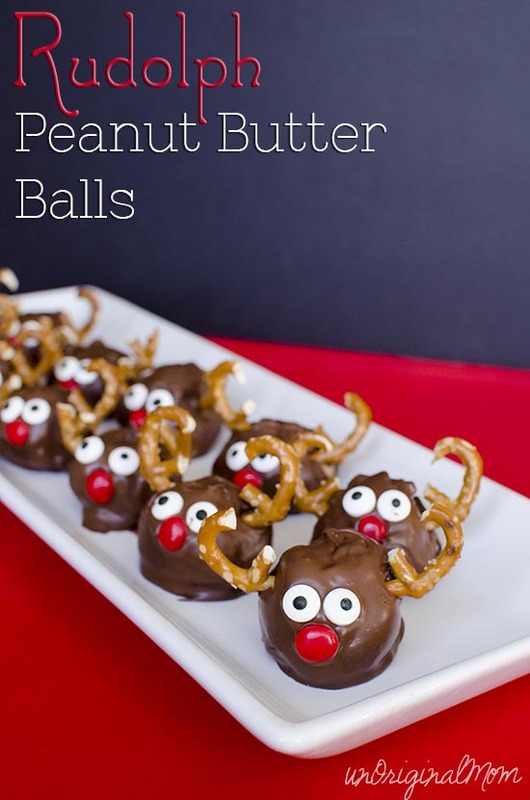 I had originally wanted to make these little reindeer peanut butter balls on a stick, so I rolled the chilled dough and put lollipop sticks in them – when I dipped them in the chocolate, though, the fell right off the sticks. 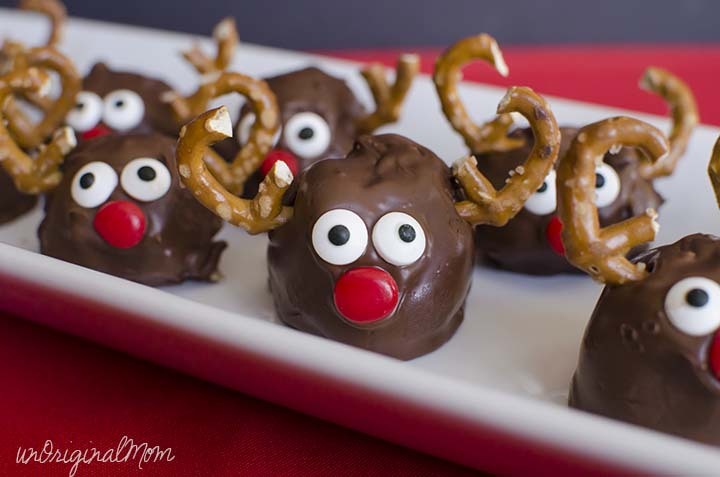 So instead, they’re just little reindeer heads…still cute, though! 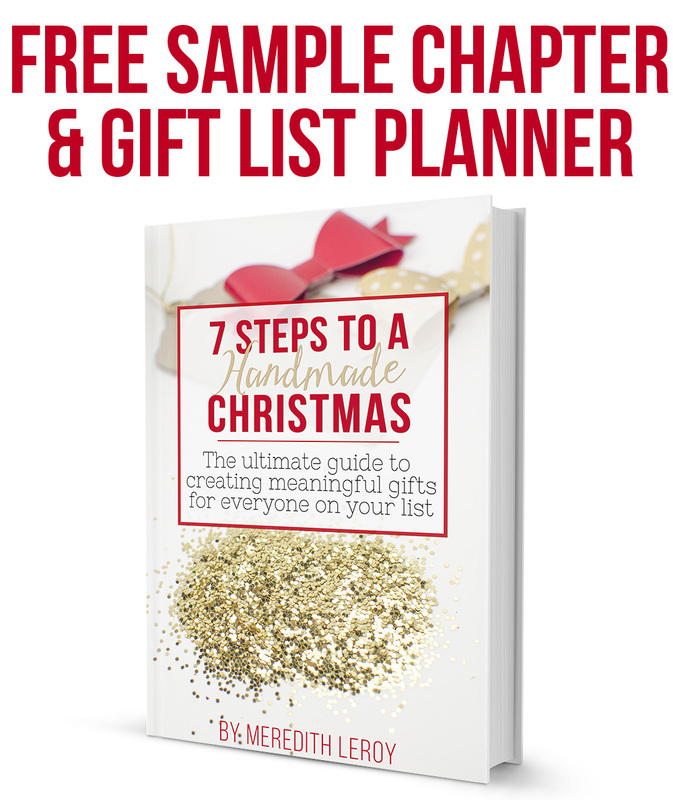 The final step is to dip your peanut butter balls into melted chocolate. The problem I had was that the peanut butter balls began to fall apart as soon as they hit the melted chocolate. In hindsight, I should have done two things differently – 1) abandoned the sticks all together and just rolled the dough into balls, using toothpicks to dip them in the chocolate. 2) Chilled the rolled balls in the freezer for at least an hour. Decorating the little Rudolphs was the fun part! 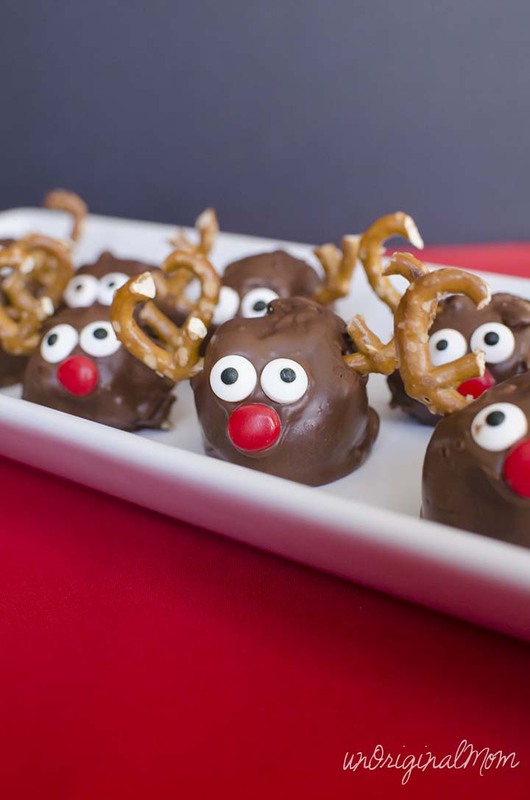 Half pretzels make the perfect antlers (though it’s difficult to break them just right – be prepared to go through quite a few pretzels to get enough intact halves! ), then add some candy eyes and cinnamon candy noses. 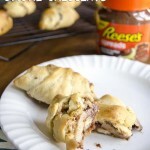 Even though they look a bit messy, they are deeelicious! I’d recommend storing them in the fridge and serving them chilled. When you go pick up your box of Honey Maid Graham Crackers, don’t forget to print this coupon to take with you! 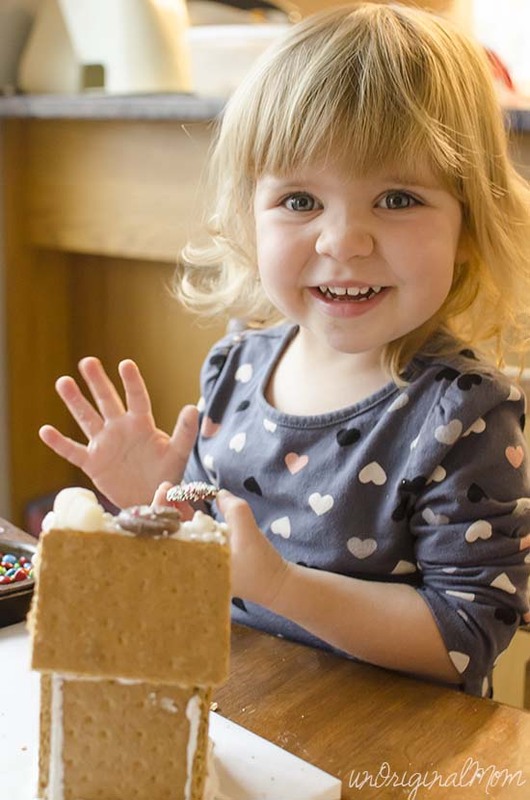 Do you have a fun memory of making graham cracker houses? 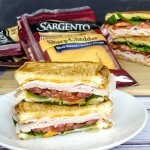 Or maybe a favorite holiday recipe that uses graham crackers? I’d love to hear about it!